That was almost 40 years ago now. 1980. OK, getting the BB out running is a big thing to us who like trains in one way or another. But I have another concern. UP may have many non fans look at the special trains. But with the 15 second news cycle we seem to be living with now, will there be ANY long term staying power of the UP message? Plus, if any of those places have any large negative issues due to people watching these trains, the negative effect might just overtake the UP message. Plus, it will make any of us who have any sort of hobby connected with trains look really bad. I hate to sound like a Hans Solo clone, but, "I have a bad feeling about this," from the start. Good grief. There are people who can make a bad thing out of literally anything. You can't let them stop you from doing everything. Wow! At $7.36 per page I think that I might be tempted to sell my HB copy! Staying power of the message? Possibly tens of thousands of children seeing with their own eyes what their grandparents, or great grandparents used to see with their own eyes! The potential memories from that experience that will last with them for a life time. Think about how many members on this forum can talk of being young and seeing steam with their fathers all across the country back in the day. The experience IS the message. Hopefully some of them will let that memory grow into a passion, a passion that suports railfaning, model railroad, and an appreciation for the history of this country and what the railroads did to advance the prosperity of the nation. Some of whom who might not have had that appreciation develop without seeing the 4014 (or 844, 3985 or insert numbers here) with their own eyes. BS politics of the UP drama aside, good on the Union Pacific. It can’t be lost in them that there might not be any upside in the end for the stockholders, yet here they are with the 4014. I agree with what Ben said. I couldn't have said it better. Possibly tens of thousands of children seeing with their own eyes what their grandparents, or great grandparents used to see with their own eyes! The potential memories from that experience that will last with them for a life time. Think about how many members on this forum can talk of being young and seeing steam with their fathers all across the country back in the day. The experience IS the message. Hopefully some of them will let that memory grow into a passion, a passion that suports railfaning, model railroad, and an appreciation for the history of this country and what the railroads did to advance the prosperity of the nation. Some of whom who might not have had that appreciation develop without seeing the 4014 (or 844, 3985 or insert numbers here) with their own eyes. Very well put, Ben. 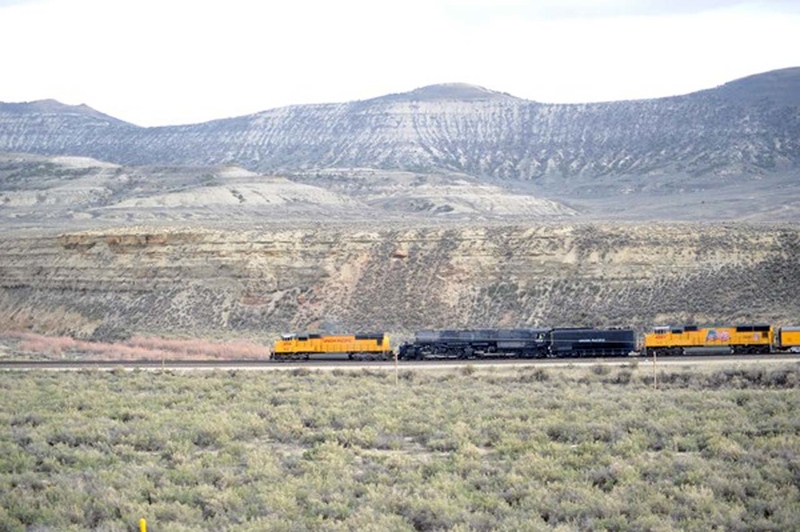 In an age where we’re starting to see large mainline steam locomotives on tourist railroads, regionals, and short lines (765 on the CVSR, 261 on the Twin Cities & Western, 1225 on the GLC, 611 on the Strasburg, 2926 and 3751 maybe on the Grand Canyon), UP is still running their steam program, still allowing steam to rocket down the mainline. Plus, now they have a BIG BOY, soon the largest and most powerful steam locomotive to operate since the steam era. Good on the UP indeed. Look for the paperback version...I paid $30 for mine. There is currently a paperback one on Abebooks for less than $30. An update from the Union Pacific Steam Team, about one hour ago. That's where I got my copies of Big Boy and either Challenger or 800's (one was off eBay but I can't remember which). Abe Books has great prices and great customer service. Which tender is that? Is it actually 4014’s or is it 3985’s? Were they intending on filling 4014's tender with dirty water? "This will ensure UP 4014 receives clean water at all times..."
There was some sort of "issue" involving dirty water wasn't there? I'll let Hotwater handle it from here. Judging by the fact that the paint doesn’t look all that new, and assuming 3985 already has this, I’ll say it’s 4014’s tender. But I think either Hot Water or Kelly would know the real answer. Back in the day, UP had extensive water treatment towers along the overland route, those are now gone. The last time I saw the 4-8-4, I believe there was a water treatment car in tow. I would assume the same protocol. It is 3985's tender. The crew doesn't have the time to even start 4014's. 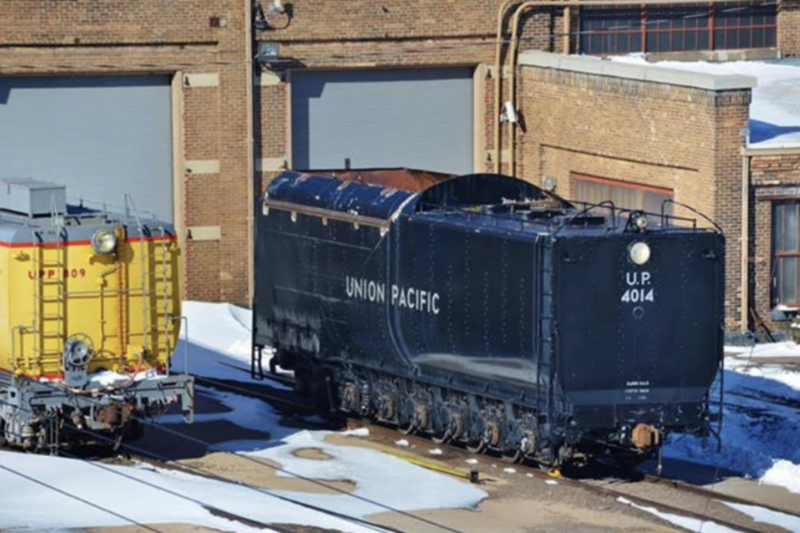 It wasn't uncommon for the Union Pacific to use some tenders interchangeably. The centipede tenders built for the Big Boys and Challengers were no different. Who really cares which tender is used? It's just a tool and there's a job that needs to get done. The Union Pacific Historical Society's 'The Streamliner' Vol.22 No.3 has a wonderful article THE TENDER BEHIND by Gordon McCulloh and James L. Ehrnberger with many of Mr. Ehrnberger's photos. Another reference from www.steamlocomotive.com/types/tenders gives a nice description of the some of the differences between the 25-C-1 through 25-C-5 tenders. They also stated that "Adding a little to the confusion for many about the Big Boy tenders was the fact that 25-C-1 and 25-C-4 tenders were completely interchangeable and were traded between both groups of Big Boys for convenience." 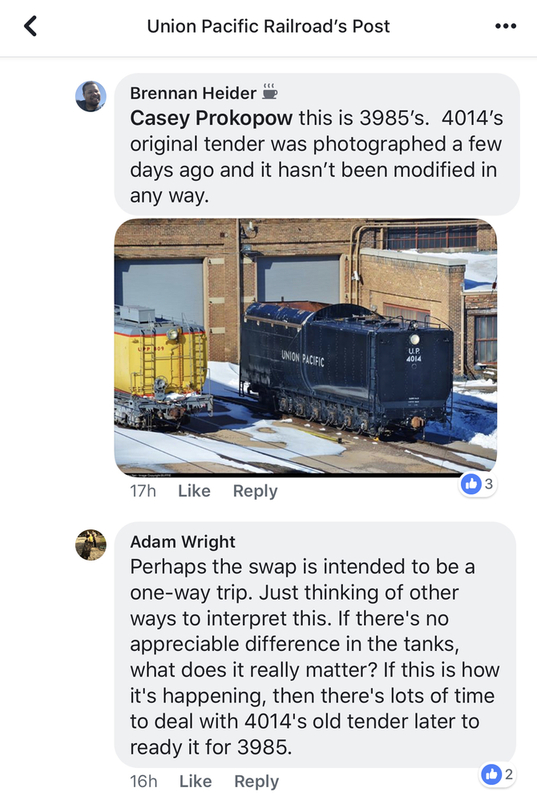 I Recognize there is difference between a statement like that and the reality of using a Challenger 3985's oil tender (which I'm pretty sure was taken from the #3977) instead of the 25-C-1 Coal tender that is likely on the 4014. I don't see it as anything impossible. 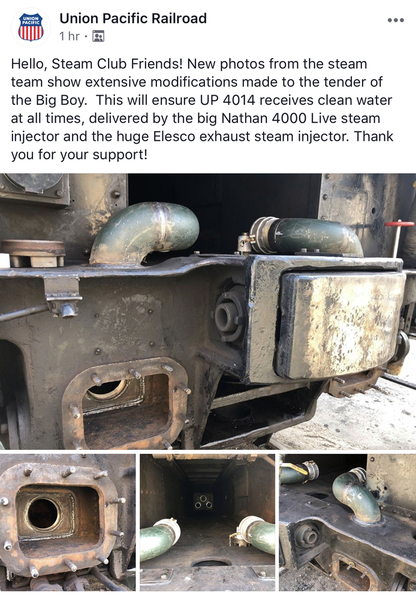 However, as I think Hot Water had stated somewhere earlier, his experienced opinion is that a bigger obstacle would be the trouble shooting and shakedown required for the proper oil firing of the Big Boy. I have no skin in the game on the current Steam manager, personally I don't care about the politics. Sounds like mistakes were made and disagreements on judgement but the fact is..... he is the one making this happen. I just want results. I'm no longer interested in blame. I'm interested in solutions. If using 3985's tender will save time for the excursion then I'm all for it. So long as there aren't any major F-UPs, I would hope that any lessons learned from using it short term will lead to better decisions being applied to the oil conversion of the 4014's tender later if that is their plan. The final fate of 3985, well...…. people will always need something to argue about. Don't let the perfect get in the way of the good. I'm looking forward to seeing a Big Boy actually steam under power. When they converted #3985 to oil they just took the the oil bunker from #3977. They didn’t do a tender swap. Ok, so 3985's 25-C-3 coal tender was converted using 3977's oil bunker. I just learned something. Thanks Spoony! Another example of why I enjoy the Ogaugerr Forum. Actually the tender for 4014 came from 4015. 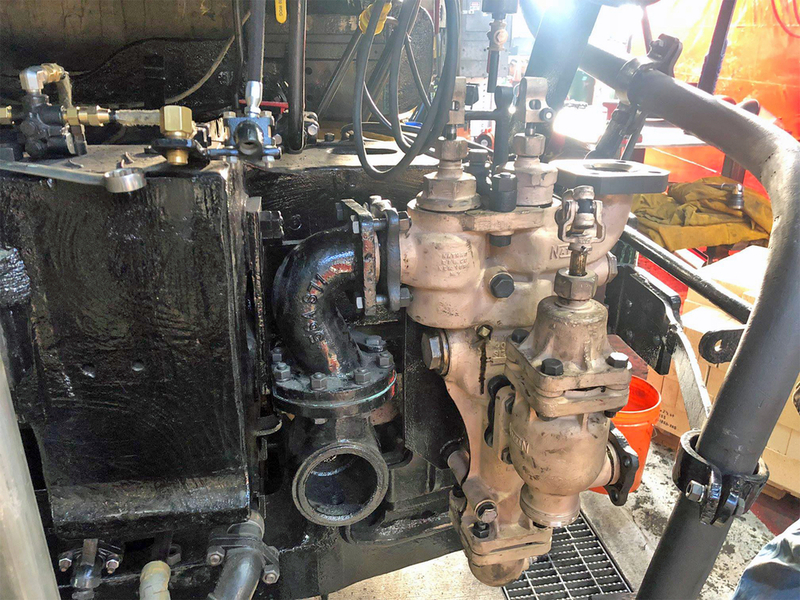 "Much of what has been written about the 4005’s brief time as an oil burner speaks of problems with uneven heating in the firebox and broken staybolts. The Steam Crew has made an important change during the 4014 restoration that was not part of the 4005’s configuration when it burned oil in the 1940’s. 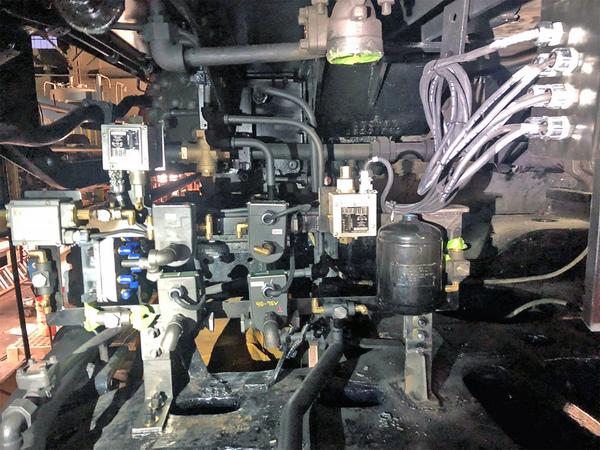 When the UP converted a steam locomotive class from coal- to oil burning, they removed the firebrick arch and the circulator tubes that supported it. In the case of the FEF Northerns like the 844, that meant the arch tubes were removed. In the case of the large Challengers like the 3985 and the 4005 Big Boy, they removed the security circulators. Security circulators were large tubes that connected the water spaces along the side of the firebox with the water space above the crown sheet. They had several functions, one of which included promoting water circulation between areas filled with relatively cool water and the area above the crown sheet, where the most vigorous boiling occurred. During the steam era on the UP, oil burning power did not use security circulators in the firebox. This practice was not unique to the UP. Southern Pacific cab forwards also didn’t use circulators (you can see this in the firebox of the SP 4294 cab forward preserved in Sacramento—no circulators in its oil-burning firebox). On the other hand, the Santa Fe did use a type of circulator tubes in its large oil burning Northerns and 2-10-4’s. For the 4014’s conversion from coal to oil firing, the Steam Crew elected to keep the security circulators in the firebox to improve water circulation, and therefore reduce the uneven heating of the crown sheet that can excessively strain the boiler structure and lead to broken staybolts and leaks. 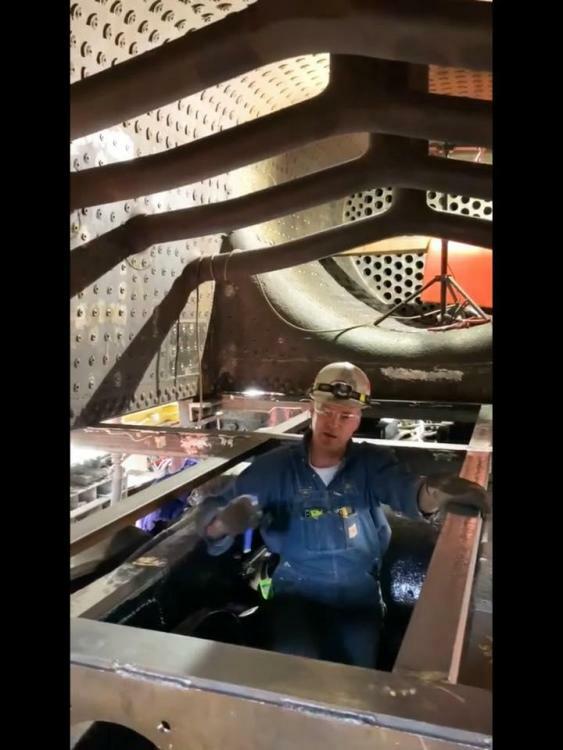 You can see the 4014’s circulators in the photo captured during an Ed Dickens update video. Compare it to the photo of the 844’s firebox, which has no circulators or arch tubes." Posted by Scott G online a few days ago: …. As in Scott George? Where was this? Their Facebook page? Thanks for posting, C. Jones. 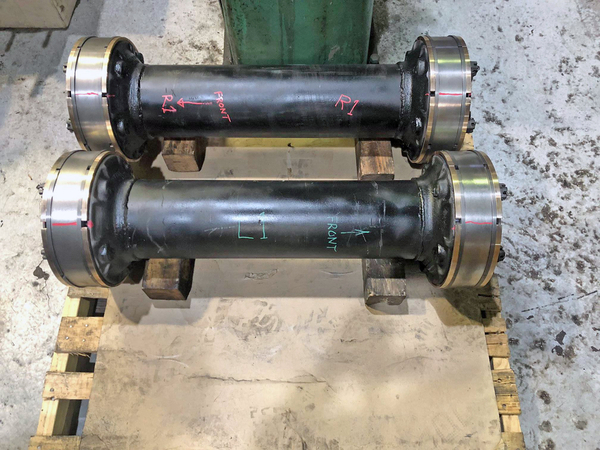 From Ed Dickens and the UP Steam Team: Here are a few photos of our recent progress: First is the massive Nathan 4000 Live Steam Injector we posted the other day; next is two of our four large, rebuilt piston valves with new rings, just like we made for the UP 844 in 2017. Finally, the cab signal and valve equipment rack. Also of note: We have taken our first load of fuel oil for the UP 4014! It's pretty messed up that UP has to post this. They should not be getting trespassers, especially after the incident that happened with 844 a few months ago. Having enjoyed this hobby for 30 years now I can tell you from direct experience that A LOT of people in the rail-fan community are complete idiots. Some historic equipment or a steam locomotive shows up and common sense and manners go out the window. Most of the time its because of someone trying to get "the perfect photo." @J611 I could not agree more. But it doesn't stop there. Then you have to add the uninformed general public to the mix. Steam locomotives are just about my favorite thing in the world, but they do bring out the worst people. 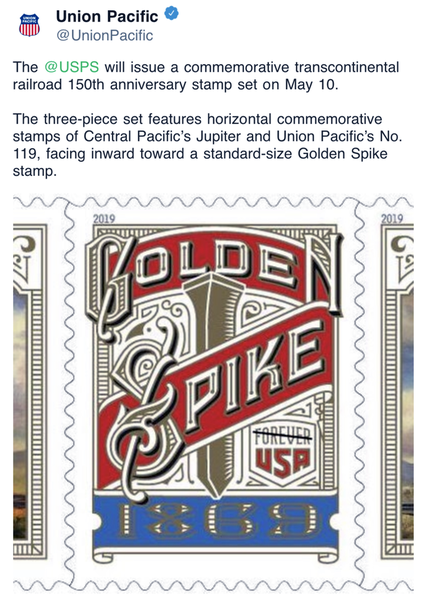 Boy, they are REALLY cutting it close to make it to Ogden in steam in May! As for railfans, I fully agree with the above. Some will do anything to get the shot they somehow feel entitled to. With time running short, it would be interesting to know more about the project management master plan for 4014's restoration. Specifically what are the remaining tasks ( especially those on the on the critical path) for 4014's run to Ogden. While photos are interesting, they don't provide an indication whether or not the project is on schedule. Personalities aside, I can only imagine the pressure the UP steam crew will be working under in April - I for one wish them success. Well, taking the limited info at it’s face, the locomotive has seen steam from the shop boiler and a load of fuel oil has been delivered. If you care to attempt to read into that, (I normally do not like to myself, but what the hell) I would suspect a fire might be lit this week. Regardless, the fact that a group of young folks will soon have a second rebuild of a very large locomotive under their belts is indeed a good omen for the future. It is too often said that there is not enough youth gaining experience in the world of steam, well this group is doing just that. I don't know what you refer to as 'young', but most of the guys are in their late 50's, only a few years from retirement! I believe he is talking about the group trying to build a Niagra steam locomotive. Most of that group is composed of 16 - 30-year-olds. I believe he was talkin about Ed and his crew. >>Steam locomotives are just about my favorite thing in the world, but they do bring out the worst people. Which is one of the valid reasons CSX gives for prohibiting steam locos on its tracks. On May 10, 2019 a commemorative stamp will be issued for the 150th anniversary of the Golden Spike. This is a three-piece set. USPS got one thing right. Thetecwas a train from CA at the last spike! And, today, where there are sustained descending grades of 1.5 percent or greater, there is normally a timetable speed restriction for trains without dynamic brake in use. Some railroads simply forbid it. The institutional knowledge of how to descend steep grades using only air brakes went out the door with the retirement of Engineers and Road Foremen who had done it.